No one told me that as my kids get older that even though they need me less, I spend more of my day with them. How is that possible? I'm finding myself more involved and committed with kid stuff than ever before. One one hand I love it. They are good kids and it's fun to watch them grow and take in all of these experiences. This time with them is just flying by. If there was a way I could slow it down, I would. In-a-heartbeat! One the other hand, I'm having a hard time fitting in a little creative time here and there. Nap times and early bed times are long gone. I find I am constantly reorganizing to fit everything in. This is not balance but rather a pendulum that swings wildly from one side to the other. I find myself holding on during each downswing, and squeeing with glee when I hit the upswing on each side (the Mama side and the Creative side). If I could, I would sit down and sew for hours at a time and make big chunks of progress all at once. That is just not possible right now. I know a lot of you can relate. Today was a good reminder that any progress is good progress and if you only have a few minutes a day, a few is better than none. I used my minutes for sewing and it felt good! Don't you love that point in a project when it starts to actually look like something? Previously posted about this project here. Soooo True! Enjoy your stolen moments! That is all too true. Like you, I take the time when and where I can. It helps me to retain a little bit of me. For me. I'd go crazy without it. love your blocks. I know exactly what you mean. It's so very hard to find some moments just for yourself. YES!!! And then the guilt…if they're off playing happily together and I slip away to do some sewing or something just for me I feel like I'm doing something "wrong" because I'm ignoring them. Which is insane because they're perfectly happy. Ugh. Being a mom is an emotional roller coaster. I leave my projects out on the sewing so that when I have a few minutes I can stop and sew on them. I can totally relate! 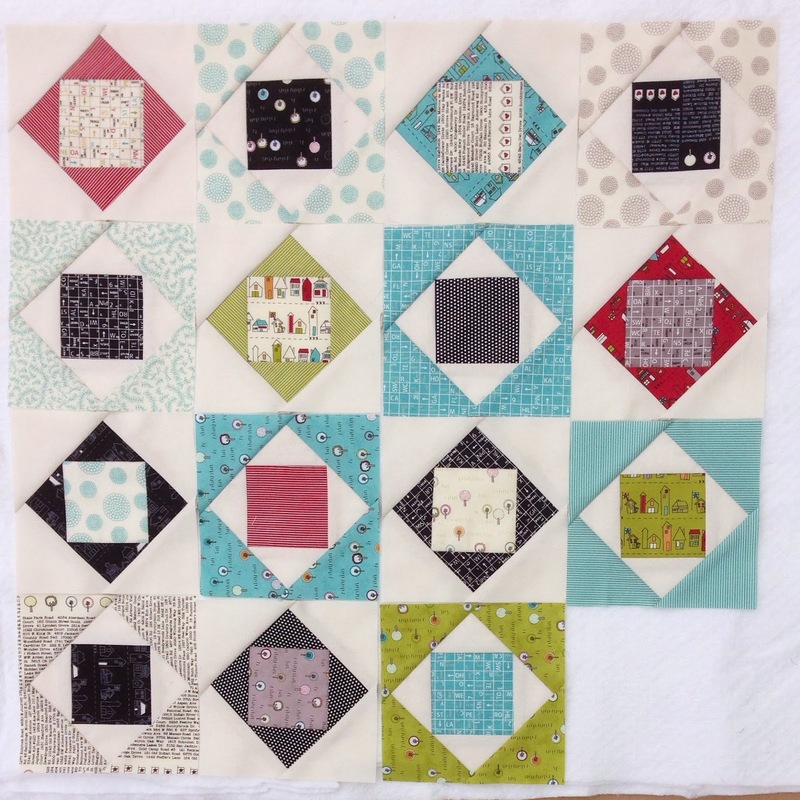 I love your blocks; great colour choices! your economy blocks are looking great. I know what you mean about the time issues. My daughter went through a crafty phase where she loved to draw and color. It was fantastic because I could set her up in the room with me and we could have girl time while I sewed. I'm always looking for opportunities like that!